The duty of the civil process is to serve civil warrants county wide. These warrants cover orders of protection, subpoenas, evictions, court ordered property repossession, and other warrants related to civil law. They also assist other agencies state wide by locating and serving civil process to Lincoln County citizens. Corrections are responsible for the safe keeping of the inmates while they are in custody at the correction facility. They are also responsible for the safety of the community by preventing inmates escaping from the facility. Inmates are able to have visitors through visitation at the facility. Visitation days are Wednesday, Saturday, and Sunday. Please call (931) 433-3111 for questions regarding visitation. 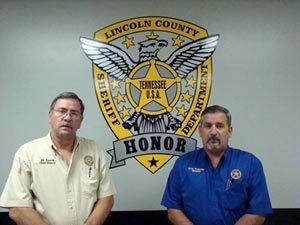 The purpose of the Criminal Investigations Unit is to investigate all crimes in Lincoln County, TN. These crimes are committed against persons, property, and society. These crimes include: arson, child abuse, sexual crimes, domestic violence, gangs, murder, robbery, theft, vandalism, forgery, among others. The Patrol Division respond to dispatched calls for service and also patrol the roads throughout the county's 580 square miles. These deputies provide security for citizen's as well as enforcing traffic laws, providing escorts (such as funeral), and serving arrest warrants.